1/4" mono, 2-track, 4-track and 8-track. If you want a copy of old tape recordings just to hear them again, or revive abandoned musical projects from years back, I can copy most anything. Tapes won't always just load up and play. Often they are stashed out of sight, in dark and damp for years, collecting dust, mold, and moisture. Tapes must be cleaned, tediously, by hand, and in most cases these materials can be removed. As a matter of well-documented fact, some tapes from the 1970's and afterward were manufactured with a material that absorbs moisture from the air and becomes tacky and sticky, making the tape impossible to play and will permanently damage the recording if you try. It will squeal and shed its oxide off as it is dragged over the heads and guides of the machine. So you have to bake the tape. The best thing to do is to heat the reel of tape in a convection oven that warms to about 130 degrees for some hours. The moisture is evaporated out, and then the tape will play, at least enough to do a digital transfer. All tapes are given a catalog number, and files named and labelled. There will be one file for each track, e.g. 24-track tape results in 24 individual mono WAV file recordings of each track of the tape that will play in sync. Tapes can be transferred at a high speed and and high sampling rate to reduce the bill. This is recommended for speech/home recordings with very low tape speeds. Recordings with excessive noises can be digitally fixed with excellent results. Crackles, pops, hiss, hum- all can be diminished. Regular studio rates apply. Clean your vinyl, transfer to CD or digital files. Pops, clicks and noise are only for the sentimental- hear what's in the grooves. Your LPs may be superior to the CD reissue. Assuming the vinyl master was properly done and a good pressing made, there are several advantages over remastered CDs when it comes to some legacy recordings. First-pressing LPs were cut from a brand-new master tape at the time. Some LPs never got released on CD, master tapes get lost, or the wrong tapes used for the remaster, or the mono mixes are not reissued, and so on. Vinyl sounds better if you clean the record before playing it. I can transfer your most beloved LPs and 45s to WAV files, or burn them onto audio CDs. Clean the record of fingerprints and any especially difficult materials like food, sugar, mold, paint, or material stuck on. I start by looking for big stuck-on stuff, then apply an enzymatic cleaner that breaks down organic materials like fingerprints, dust, food, saliva, etc. which really gets a lot of the old crud out after a couple minutes. I wash the grooves with a VPI 16.5 wet record cleaner. I apply a solution, and extract it all back out with a strong vacuum, much like a carpet cleaner does. Once the record has come clean, it's ready for transfer. Even a brand-new unplayed record benefits from cleaning away the mold release compound (so it doesn't stick to the stamper) that all records have on them. Once it's deemed as clean as possible, I audition the disc, adjusting the vertical tracking angle (VTA) by ear. Every record is a little different. Once that is decided on, I transfer to digital. If one side of a mono record is better (less noise) than another, I can opt to take only one side of the stereo cartridge for transfer. The equipment is a VPI Scoutmaster turntable, a Benz S wood body cartridge, an Ayre P-5xe phono stage into a Tascam DVRA1000. All balanced interconnects by Transparent. 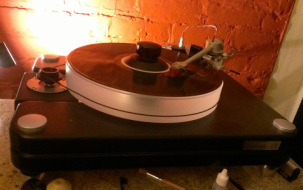 If the records have scratches and surface noise, I can work on minimizing those, in many cases completely removing it. Due to the nature of the work, these sessions are unattended. A typical album would cost $50, an additional $15 to clean up the scratches and noise. Cassette tapes restored, transferred to digital on a Nakamichi CR-5A. Cassettes won't need to be baked. The typical process is to repair the cassette if necessary, or move the tape into a new shell. I align the head azimuth to the tape. Transfers to digital are made, and then there are options of computer-based spectral noise reduction, including removing unwanted tape hiss, background noise. There were a lot of recordings made on ADAT machines from 1992 onward, and if you haven't fired up your ADAT machine lately, you may discover that your machine might not be working so well anymore. It is recommended that any ADAT tape from the '90s should be copied sooner than later. I can transfer type I ADAT tapes to digital files for remix or archiving in a modern format. I can also transfer DAT tapes.